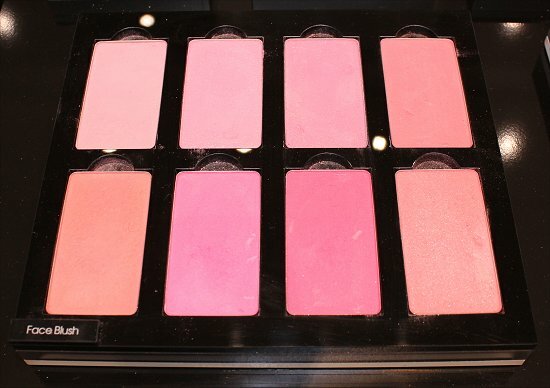 No doubt you’ve read glowing reviews of Inglot makeup products on many beauty blogs. (I sure did!) 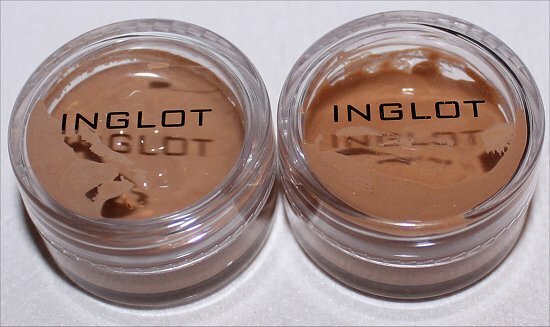 Strange thing is that I never dabbled into Inglot makeup before, despite hearing rave reviews. Well, that all ends now because I think that I’m in love! Especially after attending the Inglot VIP beauty blogger event yesterday, I feel that the location fits the brand’s image perfectly. 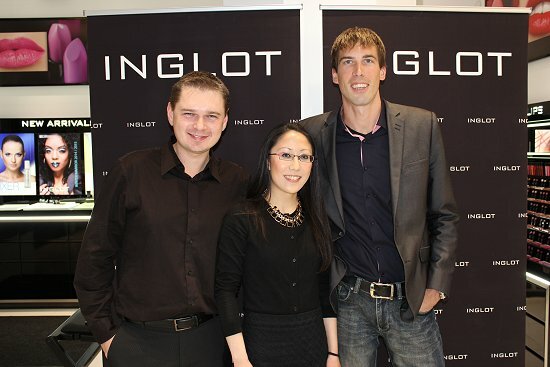 In the photo above, I’m standing beside the Inglot presidents, Marcin Bielen (left) and Silver Laus (right). 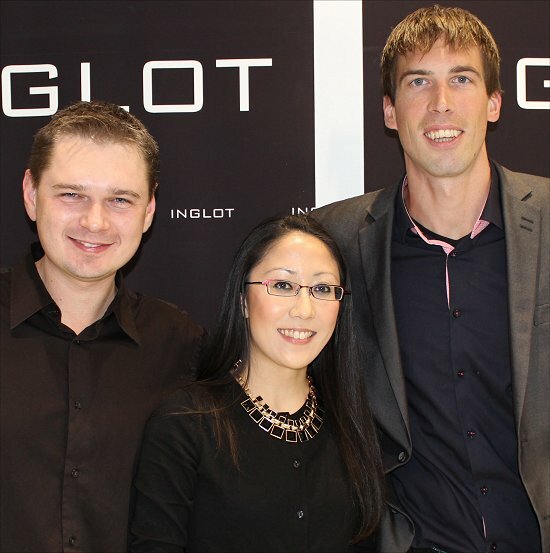 In addition to getting a tutorial by Asha Houghton featuring the new Inglot HD Perfect Cover Up Foundation, I also got to speak with Marcin Bielen in-depth about Inglot. 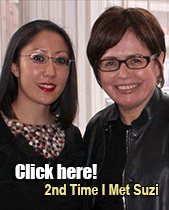 (How many makeup company presidents do you know who will give you the time of day and actually chat with you one-on-one, treating you with respect instead of as your superior?) My conversation with Marcin quickly made me realize that Inglot is a company that’s doing things differently and better! 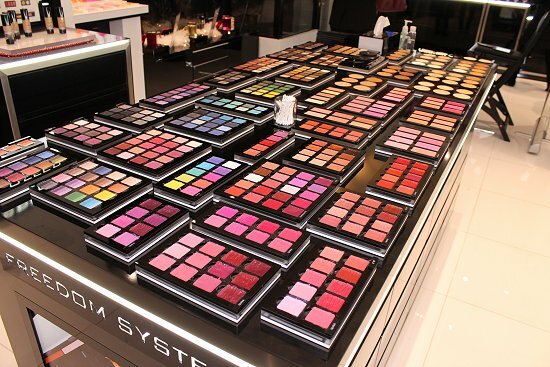 Also, if you have any questions about Inglot, feel free to leave a comment and ask me. I will be more than happy to reach out to Inglot to get your questions answered! 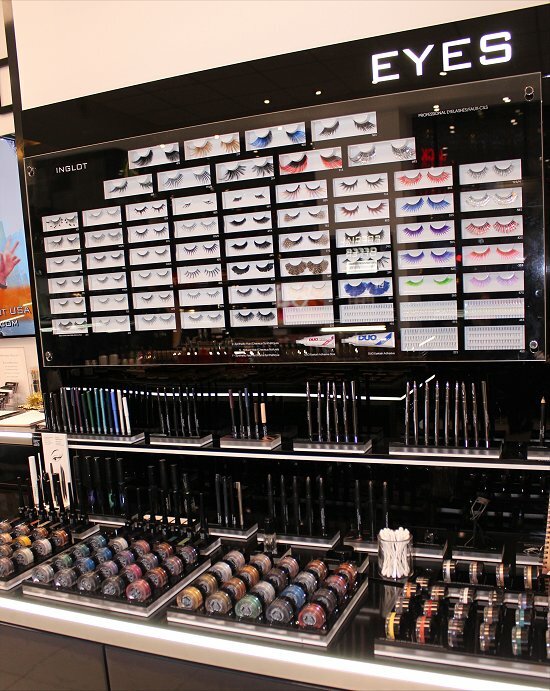 The Inglot store in Toronto is small, but mighty. 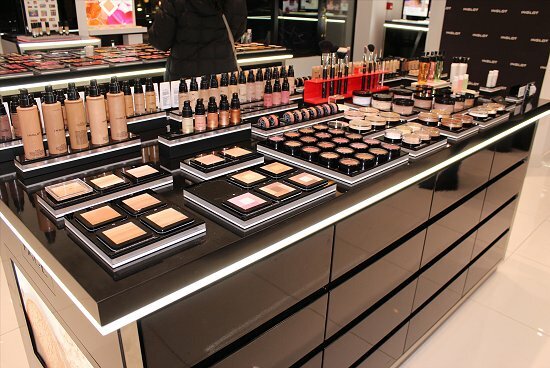 😉 It’s a playground for makeup junkies like myself because everything is displayed out in the open. You can swatch to your heart’s content and feast your eyes on all the gorgeous products! You’ll also be happy to learn that Inglot makeup is paraben-free and fragrance-free (obviously except for their solid perfumes). Bronzers, highlighters, and pressed powders! Oh my! And for those who are conscious about the ingredients in their nail polishes, rest assured that Inglot nail polishes don’t have Toluene, Formadehyde, DBP, or Camphor! I have never seen any other company come out with breathable nail polish! 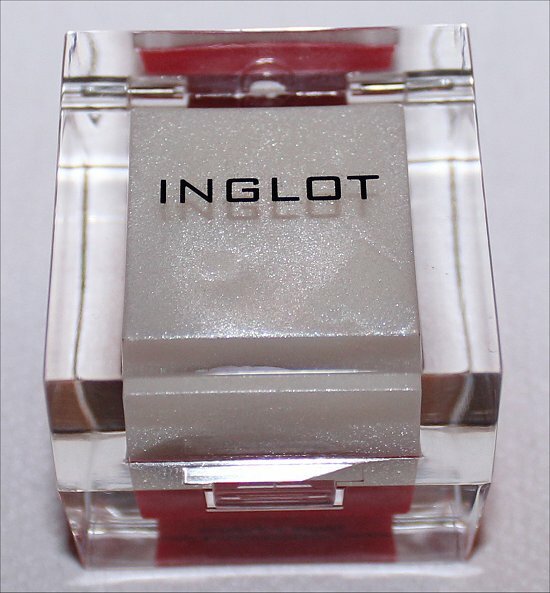 Inglot’s O2M nail polish features a breathable formula. 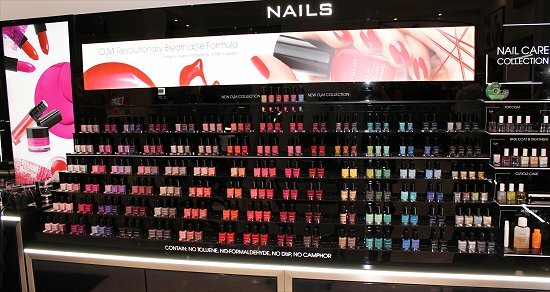 When I was speaking with Marcin, he told me that the Inglot O2M nail polishes became a surprising hit among Muslim women! As you may know, Muslims are required to wash their hands during prayer to purify themselves. Washing their hands (including nails) is done during prayers five times per day. This means that any nail polish needs to be removed before prayers and then reapplied afterwards. Ain’t nobody got time fo’ dat! With the Inglot O2M formula, they can keep their polish on, since the formula allows water and oxygen to permeate the nail. 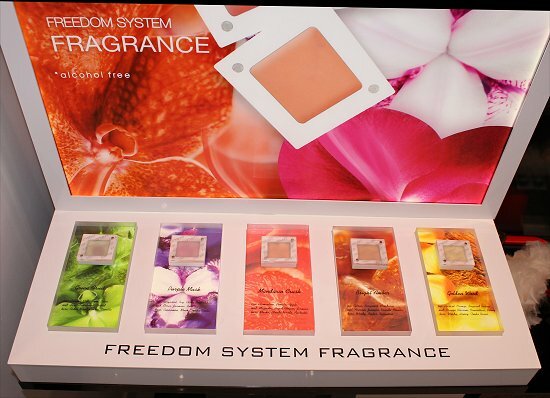 Also, Marcin told me that the formula is long-lasting and chip-resistant. Even when his wife was in the water a lot during a vacation, it stayed on and looked great! 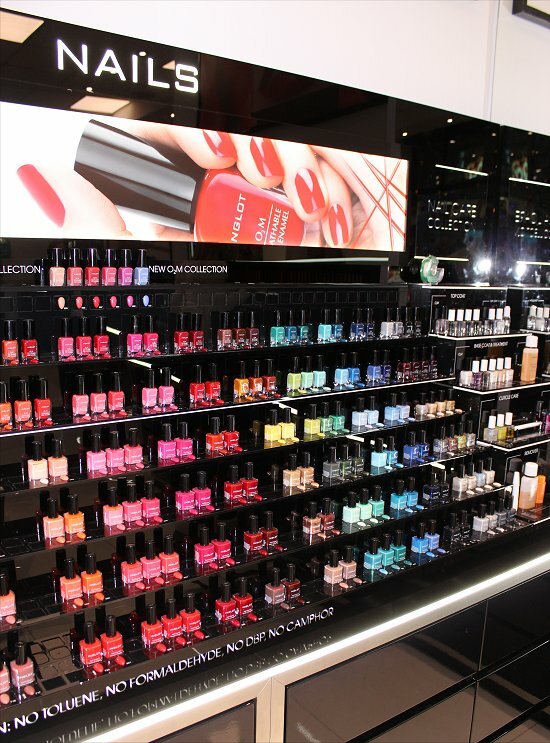 Yup – I think that I’m going to have to go back to pick up some of these Inglot O2M nail polishes to try out. I’ve never seen or heard of anything like them! Have you? 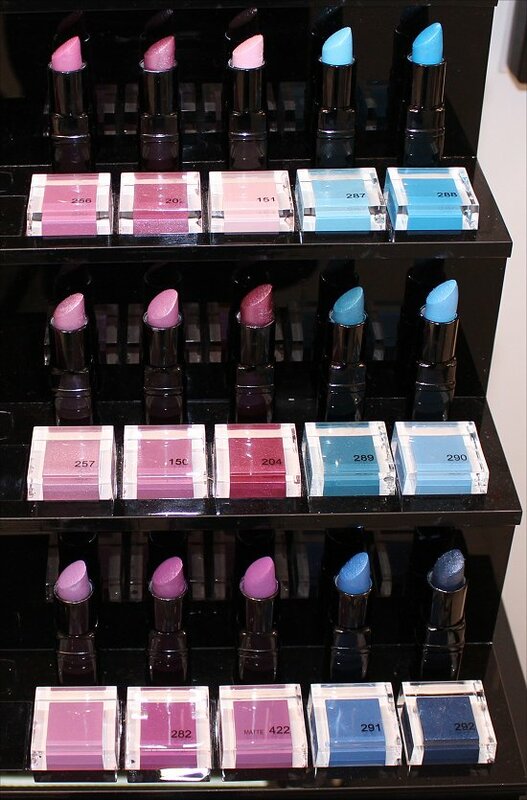 Let’s take a moment to enjoy these purple lipsticks! I’m a huge fan of purple lips, and some of these are making my heart sing like Mariah Carey in her 1990 prime! Check out the blues and yellows! Say what?! 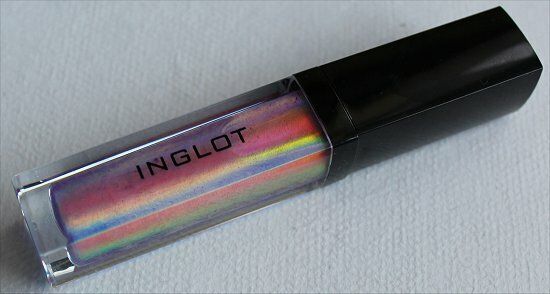 Did you see the incredible Inglot lip gloss that I bought? I posted a video and photo on Instagram because it was so spectacular! 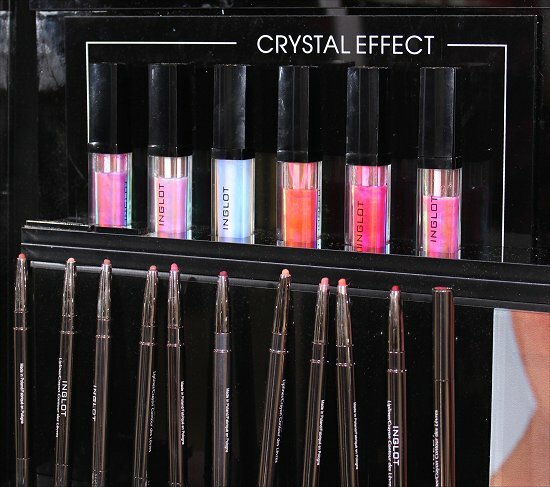 I took a photo of the Crystal Effect lip glosses to show you the range, but it seriously doesn’t do any of them justice. They are multichrome wonders! 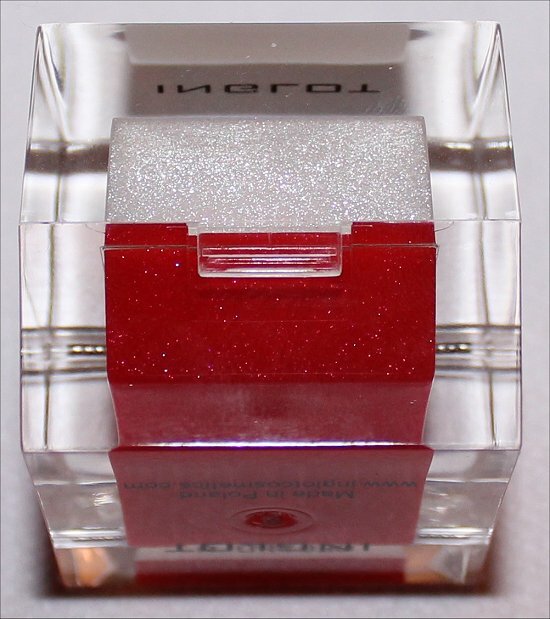 There are plenty of multichrome lip glosses with the special “Crystal Effect”! Trust me – they’re waaaaay prettier in person! 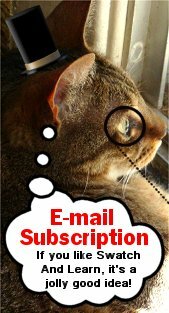 Eyelashes and eye products? 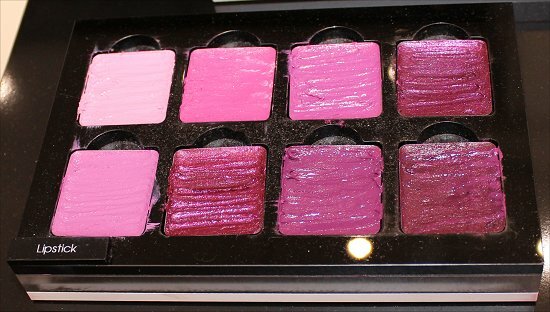 Inglot has plenty of those, too! I bought two of these gel liners – the black and a purple! 🙂 Super excited to try them out! 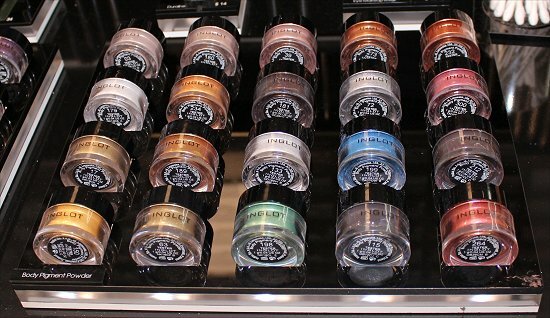 Marcin told me that if you use the transformer with these pigments, you can create the look of gel liners! Pretty cool, right? I had no idea that Inglot had fragrances! They’re in solid form, and they have a cool lid that slides to “open”. I smelled them all, and they were really nice! I may have to buy some to wear soon. The display was cool because it was magnetic. Each fragrance square snapped into place! These are the new makeup arrivals! It felt lightweight on the skin, and it provided excellent coverage – pretty full coverage, in my opinion! 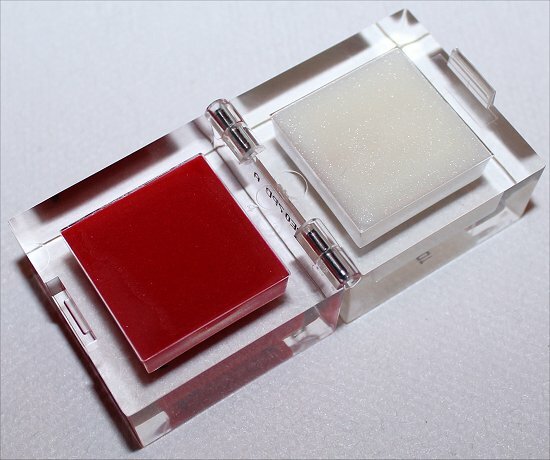 Another cool thing that made me feel like a true VIP is that they handed out this unique cube with two different lip shades. Asha was showing us a cool trick for how you can figure out where to contour. Using your hand in this placement, that’s where you want your contour to be. You can also use a pencil and line it up from your ear to your mouth. Good tip! She also said that when she contours clients’/customers’ noses, it’s “not your nose, it’s the shape” that she’s altering. I think that’s a wonderful way to think because everyone is beautiful and unique. There’s nothing wrong with anyone’s physical attributes. With makeup, you can just contour to enhance the shape. Asha has been a makeup artist for 8 years. 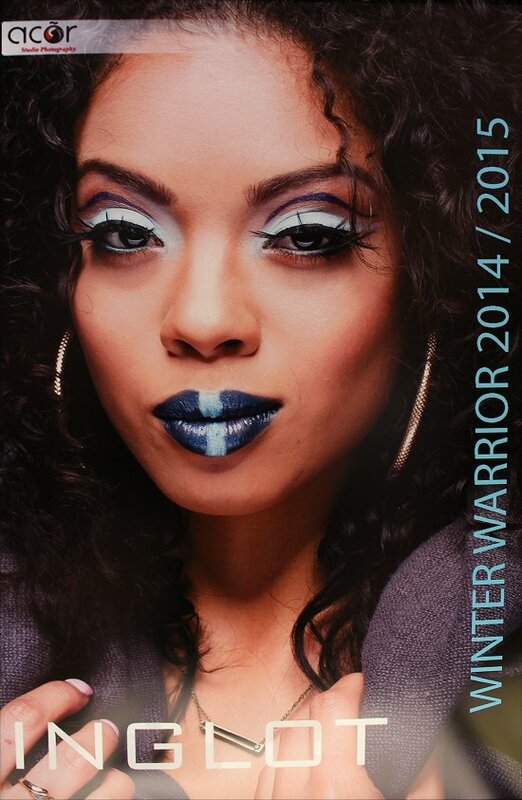 She worked for MAC Cosmetics for 4 years prior to being at Inglot. And while she did this makeup tutorial for Inglot, her official title according to her Inglot business card is Public Relations Manager. 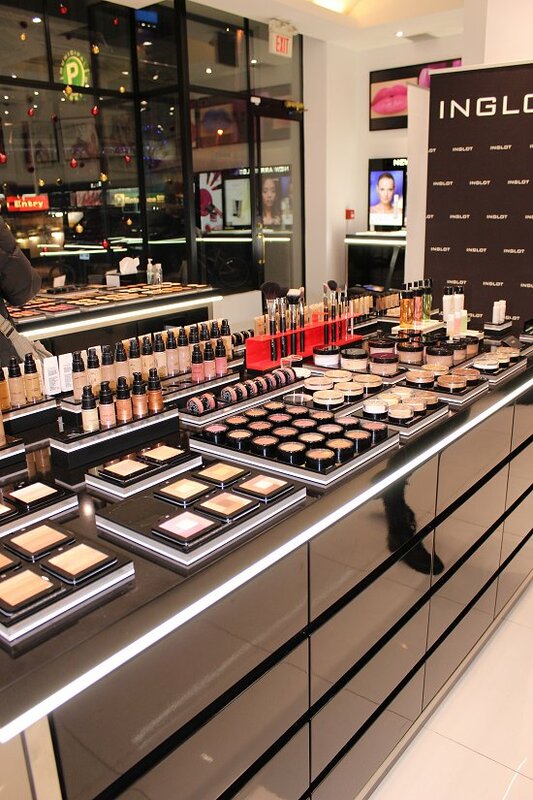 She is very friendly (like all the Inglot staff), and I loved how the vibe at the store was very welcoming. 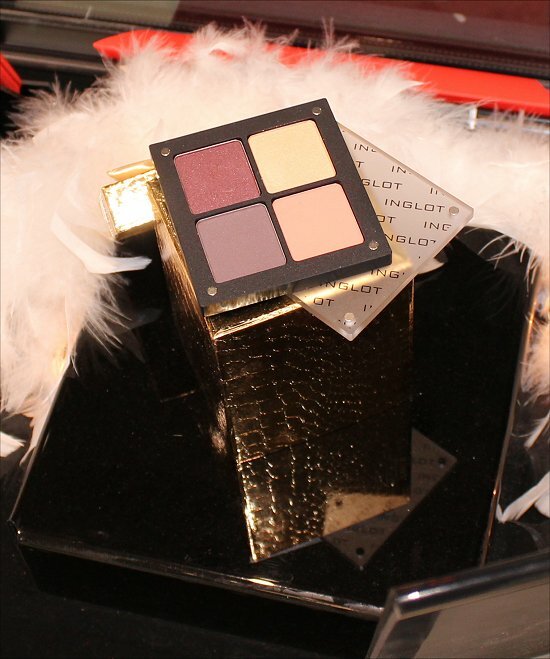 Another thing I picked up during this event is that Inglot doesn’t believe in having limited-edition products. I’m so happy about this because we all have fallen in love with a limited-edition product, only to find out that it has been discontinued! 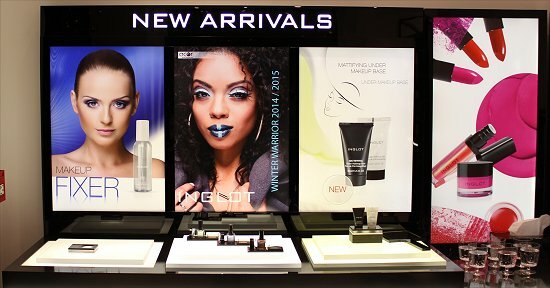 I love how Inglot believes in lasting products that defy trends – they’re in it for the long haul! I also asked what some of their best-selling products were, and Marcin pointed out the gel eyeliners and O2M nail polishes, among others. He also informed me that other makeup companies don’t use as high a percentage of pigment as Inglot does. This means that with other makeup, you have to layer the product and use more of it to get the desired effect. But, with Inglot makeup, I think he said that there’s 75% pigment, which means you can use less and get better colour payoff! Good to know! 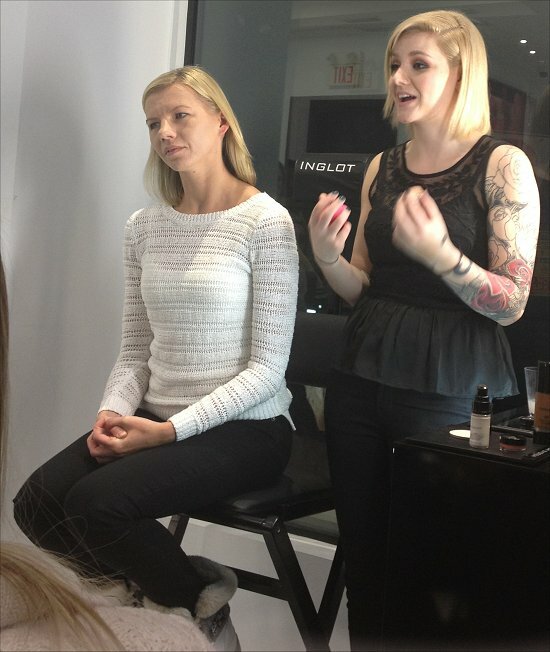 They also gave me a press release, thanking me for attending the Inglot VIP event. That was really nice because it solidified my perception that Inglot is a personal company. They care about your opinions and about improving their products. To me, that speaks volumes! It’s an interesting story how I got invited to this Inglot event. On Saturday, Zenorah and I hit up Inglot, and I purchased some items. 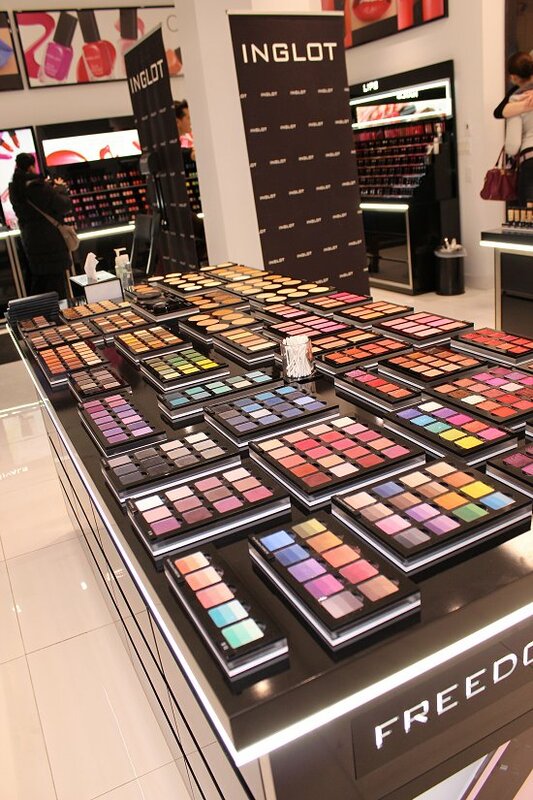 This is a little glimpse into Inglot. You can bet that it won’t be the last you hear about it on Swatch And Learn. 😉 I bought so many items, and I’ll be testing them out. Expect a review or two! 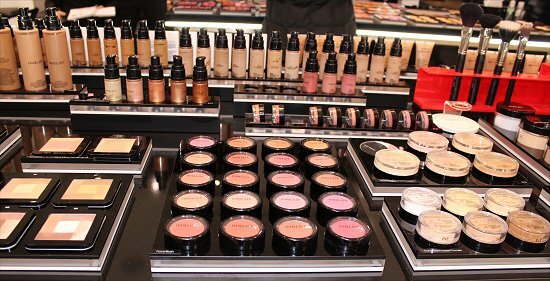 I hope you enjoyed this blog post – You can probably tell that I was extremely excited about this event, and I’m so happy to see that Inglot is taking a personal approach to encourage customers for life, rather than just trying to grab quick cash. To me, that says so much about their company, and the fact that they value the opinions of bloggers and customers means that Inglot is going to continue making their indelible mark in the beauty industry! I can’t wait to see what they come out with next! 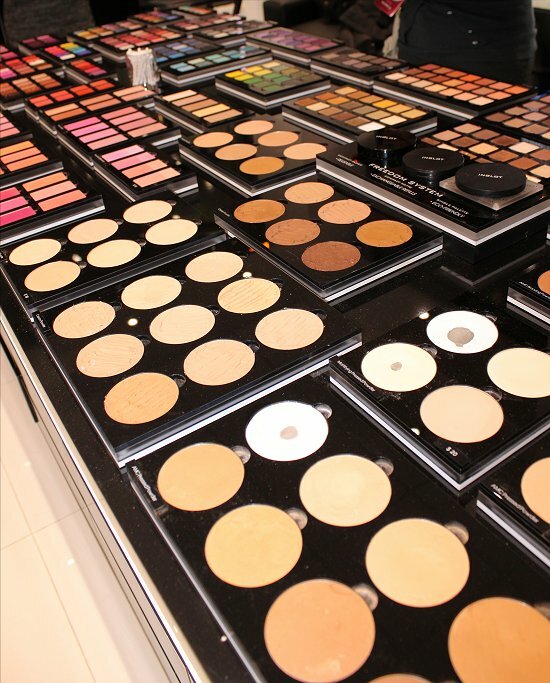 Have you tried any makeup by Inglot? 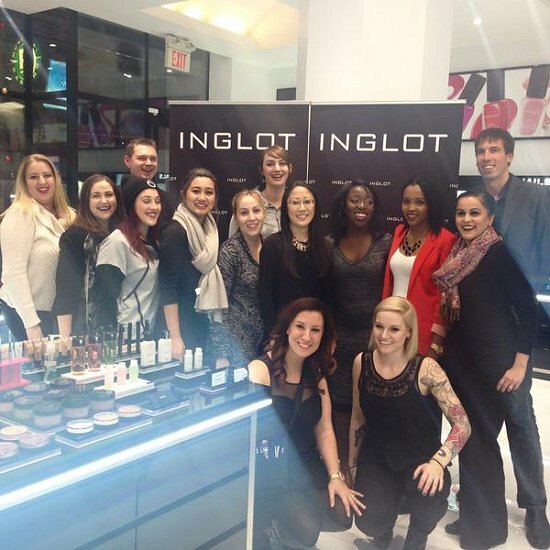 If you live in Toronto, have you swung by the Inglot store at Yonge-Dundas Square? What’s your favourite makeup brand, and why? 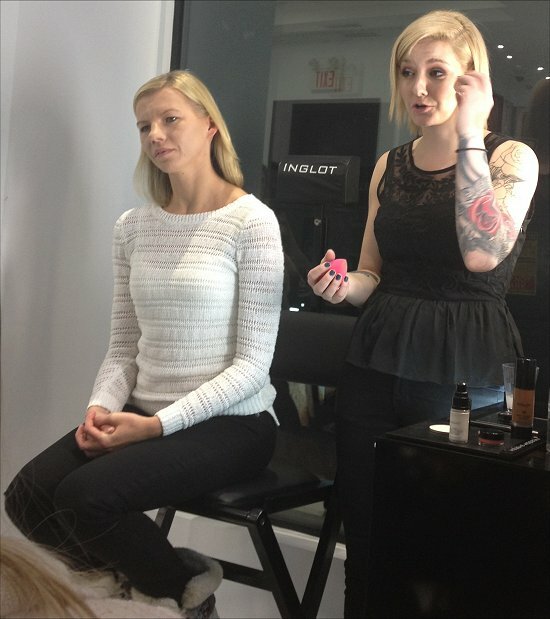 This entry was posted in Blog News and tagged Inglot on December 8, 2014 by Mary S.. It looks like you had a lot of fun! Thanks for sharing the experience with us!!! I had such a blast! 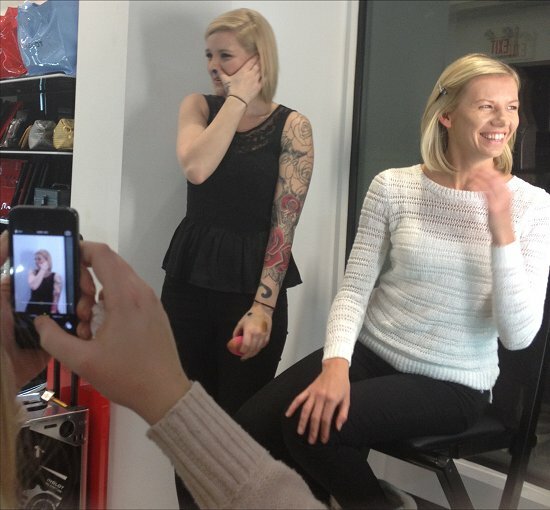 It was really refreshing and inspiring to see a makeup company with a personal approach and amazing products. Aww it was so nice to meet you too! And you’re not the only one that thinks I resemble Kat Dennings 🙂 Glad that you fell in love with Inglot. My Inglot collection is slowly growing and I love it all!